Colin G is the society’s work boat. Built in 1985, in 2014 it was modified to provides a safe working platform at both water and tree level, has a 500 kg davit to lift heavy objects from the water and a large storage area for waste materials. 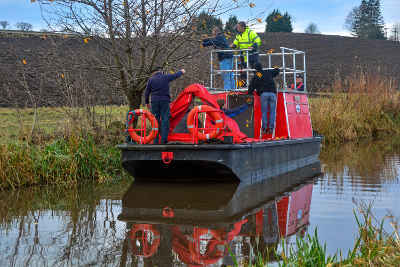 Its main use is to clear overhanging branches in the vicinity of the Linlithgow Canal Centre. Any organisations wishing to use Colin G should contact info@lucs.org.uk. In 1985 apprentices at Edinburgh’s Telford College built a small passenger boat which was named “Alex Inglis” after the then Principal. When built, she was loaned to LUCS for two years during which time she served as both a passenger boat and a floating tea shop. In 1988 she was moved to the Forth & Clyde canal, but was returned to LUCS in 1999 when she was converted to a work boat. Later that year she was contracted to move scaffolding for repairs at the Avon Aqueduct. Work was undertaken to improve her effectiveness as a workboat in 2013 and 2014. This included fitting a cabin which also provided a safe working platform and the provision of a davit. This work was financed by the Scottish Government and the European Union funded West Lothian LEADER programme. The completion of this conversion was marked by a small ceremony on 19th November 2014 during which Alex Inglis was renamed “Colin G” after the late Colin Galloway, a former Chairman of the Society and notable LUCS stalwart.